In Behavior, Nicole Eisenman addresses the problem of gender relations by reverting to the familiar sexual metaphor of talking about the birds and the bees. Based on her own fairy tale, this installation is centered around the epic battle between the sexes seen from the lesbian perspective. So in a twist of circumstance delicate flowers seek protection from the sting of the deadly and pestilant bees by hiring an all female S.W.A.T. team (gleefully enacted by Eisenman and her friends in a series of photographs). 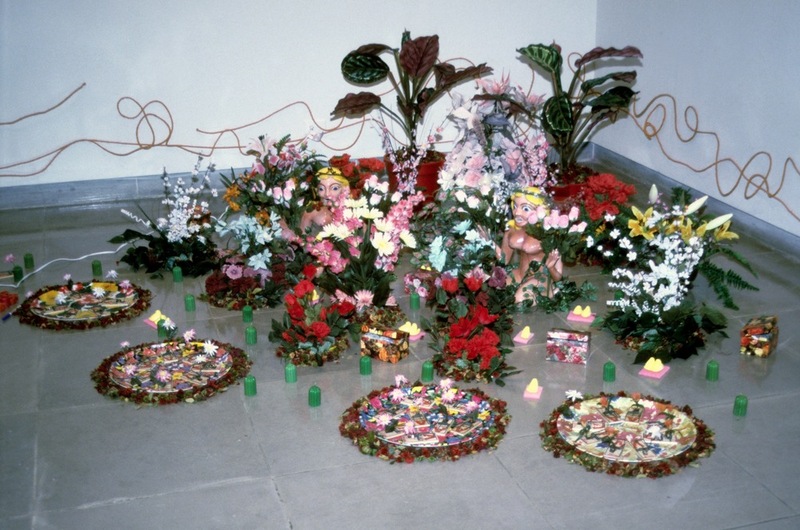 Eisenman uses any medium available to help depict her fantasy world and transforms the gallery into what resembles the rather messy left-overs of a teenager’s game room. Photos are pinned to the wall, and there is stuff piled on a table which reveals its purpose on closer inspection: Wasp killer and fly swatters sit next to biscuits which may be bee-bait. This is Eisenman’s War Room, in which the plan to “stop the damn bees” is hatched. A tactical map reveals the bees imminent menace to the Jersey Shore. The SWAT team is obviously hoping to lure the bees from their hive on one side of the gallery to a shrine-like paradise island made up of artificial flowers and marshmallow ducks designed to seduce and trap them. 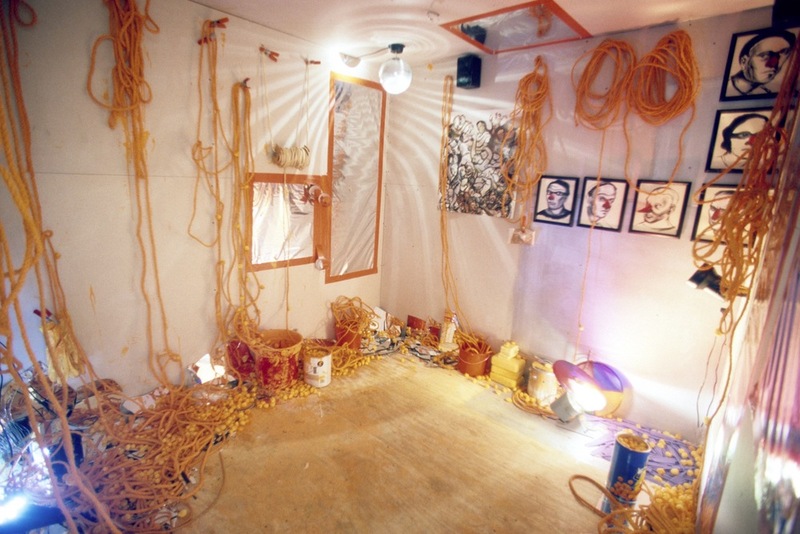 These different thematic stages of the tale are all connected with coils of orange rope which wind around the gallery literally like the thread of the tale. “I would like visitors to pick up the narrative and follow it around like an opera,” Eisenman has said of her new work. And in true operatic (yet comic-book style) tradition, Eisenman’s tale is filled with the romantic idealism that we can wage war on injustice, allowing us to transform ourselves into Wonder Woman for the duration of our visit. 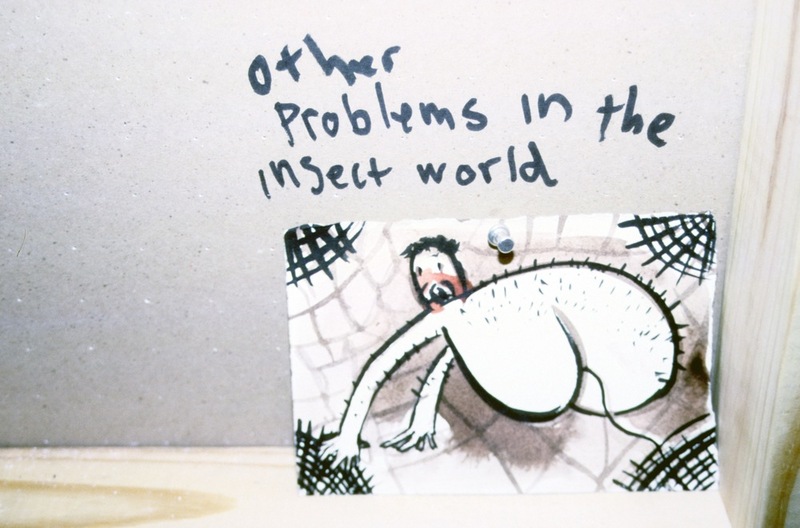 Although her work has been widely exhibited in the United States and Europe, this presentation of Behavior marks the first time Eisenman’s special brand of irreverent humor is introduced to Houston. Nicole Eisenman is a New York based artist known for witty and subversive work that is often loaded with gendered innuendo and cultural critique. Born in Verdun, France in 1963, where her father, an Army psychiatrist, was stationed, Nicole Eisenman grew up in Scarsdale, New York. She earned her master’s degree in painting from the Rhode Island School of Design in 1987. After graduating, employment as a commercial mural painter reaffirmed her long-standing interest in drawing and painting. Finely honed skill in these media and an ironic sensibility helped her develop her signature-style drawings which she has described as “Caravaggio meets Harvey Comics” and contributed to her reputation as a shrewd social satirist, who draws from art history and popular culture to create humorous works with darker undertones.